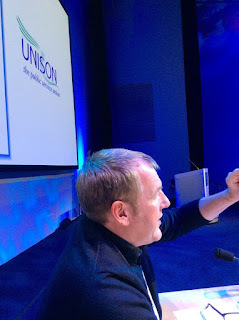 Picture of UNISON Capital Stewardship officer, Colin Meech, at last nights fringe "Why Governance and Economics Are Now Critical for Members". This took place at the end of Local Government Conference and the eve of National delegate conference. I chaired the meeting and started by apologising for my voice since I have started the conference with a cold. Normally we all get colds by the end of conference. Colin began by pointing out that all UK Pensions funds don't know how much they cost. 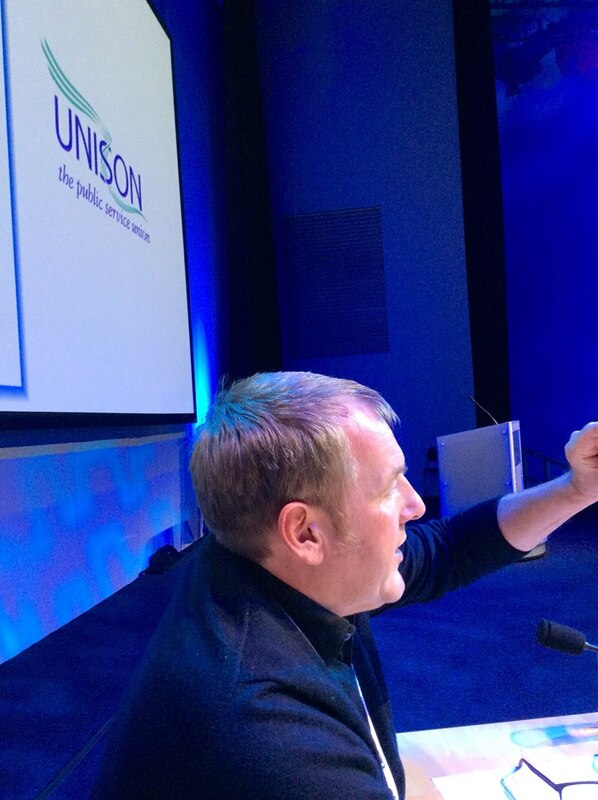 Even the Unison staff scheme doesn't. The Netherlands are the only place they do know how much they cost and this has seen costs cut by up to half. The true costs and fees of pension schemes have been massively understated. Transport pension scheme "Railpen" estimate that some £350 million of costs had been hidden by their fund managers. The New York City 5 public pension funds found that over 10 years they had an income of $40 million but their costs were $2 billion! The new Local Government Pension Boards have a statutory duty to ensure that funds are effective and efficient. We cannot assume that funds are being run in your interests. Remember that scheme members are liable for increases in costs. Employer costs are capped (13% of payroll). If this cap is exceeded by more than 2% then the LGPS will have to either increase employee contributions, cut benefits or both. Any money that leaks out of the LGPS is money that is not available for you to have a pay rise. Each Board must have a thorough examination of every penny of costs. If you reduce costs you increase your income. Costs are critical. Don't forget that most Tory Party funding is from the City of London. In the Q&A Colin was asked how to stop cronies of Council managers being appointed to a Pension Board? He said if the selection process was unfair then local branches must make a complaint first to the local Board, then to the National Advisory board and ultimately to the DCLG. Once a Board is established it is supposed to be independent of the administering authority. Boards should also pick who chairs meetings. This should be discussed at the first meeting of a Board. Need to address structural problems now. All costs have to be made transparent so you can see what efficiencies there are and we must look again at the merger of the 89 funds. This was blocked in the run up to the General election. However, the Tories now want to save money. Remember that things that get seen, get measured. Things that are hidden are not. Now we can use the example of Holland who have transparent pensions. I made a point in response to a question about whether the LGPS is sustainable, that pensions are expensive and cost money. If you want to have a decent pension when you retire then whether you work in the public or private sector, your employer is going to have to put an significant amount of money into a pension plan for you. If they don't then you will retire in poverty. A final question was about whether scale and being managed in-house saved money. Colin confirmed that the best performing pension funds tend to be the largest and that the funds with the lowest costs are the large ones who manage the money in house and do not employ expensive external managers. The average LGPS pension fund costs £141 per member. The West Yorkshire fund only costs £26 per member. You have to look at cost and stop everyone having a slice of your pie. After the fringe I had to rush off to the London regional meeting.